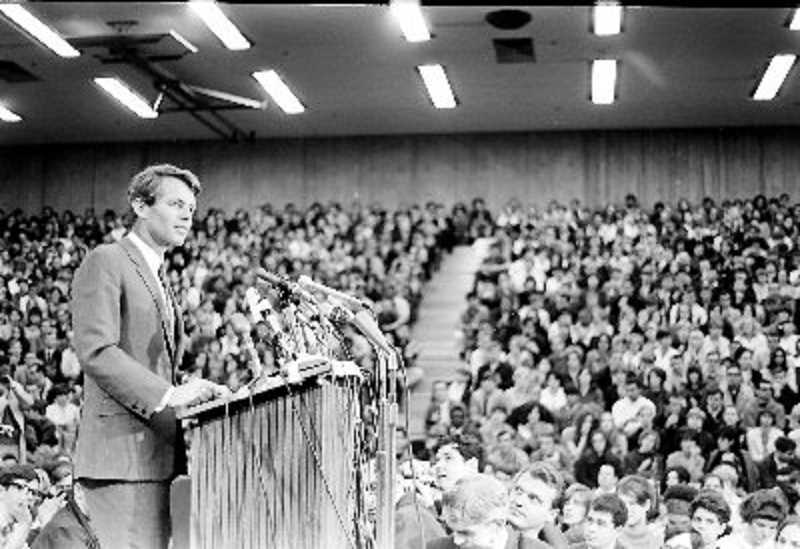 While RFK appeared at SHS on May 17, 1968, he was a no-show at a Beaverton Elks function, and Ted Kennedy told a forum he was voting for McCarthy. When Robert F. Kennedy pushed towards the tail end of his quest to win the Oregon primary, he and his campaign staff were generous with their time in the Beaverton area. On May 17, 1968, Kennedy would make an appearance at Sunset High School, the second night of a three-day Model Democratic Nominating Convention. 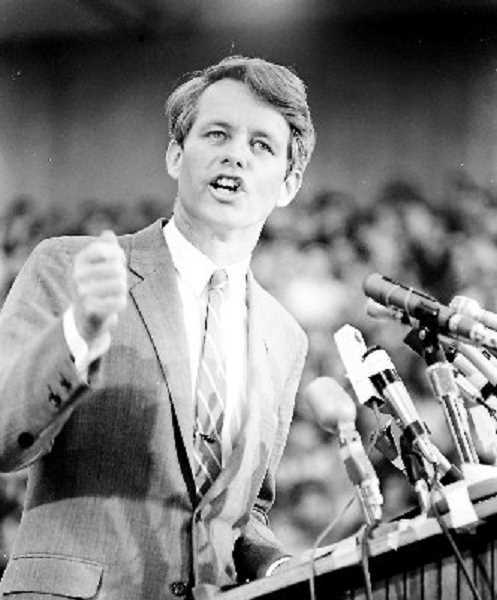 The convention drew 1,300 Sunset High School students and a front page photo appeared in the May 23, 1968, Beaverton Valley Times showed crowds at the convention with a photo caption reading that those in attendance were there to "greet, then mob keynote speaker Robert Kennedy." Brenda Holman, who was likely a Sunset High student, chronicled the Sunset event. "Kennedy, complete with staff entourage and trailing press members, turned on the Eastern charm," wrote Holman. "The star appeal was there, reports one Sunset observer, but many delegates seemed disappointed by the lack of real depth in the Senator's address. It was as though he were speaking to teen-agers (rather) than delegates." Holman went on to note that thousands of hours went into the preparation of convention the agenda and "delegates steeped themselves in party lore, current events and candidate's views so that they could accurately mirror an actual nominating session." In the end, the Sunset High Model Democratic Nominating Convention named Humphrey to lead the Democrats, according a poll taken at the event. "When Texas' unexpected pledge of all its votes for Humphrey … early in the third ballot, pandemonium broke loose," wrote Holman. "Delegates became hysterical, the Texas section was mobbed, signs and banners were shredded to bits. It was all over but the shouting." Ironically, inside the same Beaverton Valley Times edition was a full page "Nixon's the One" advertisement, touting the man who would ultimately become president. • Pierre Salinger, former press secretary for John F. Kennedy, and also a spokesman for the Robert F. Kennedy campaign, planned to attend the Beaverton Area Jaycees as featured guest at a restaurant known as the White Elephant Restaurant on Saturday, May 25, 1968. Whether he showed up isn't immediately clear because there was no follow-up story. • While a crowd of between 50 to 60 locals braved intermittent rain showers to show up at a May 26 Beaverton Elks Lodge event — where Kennedy was supposed to unveil the organization's Janigian War Memorial — the senator was a no-show. His campaign would blame a communications gap for the non-appearance, saying he spent the day visiting local shopping centers. Kennedy would later send the Elks a telegram apologizing for the mix-up.